The Milledgeville-Baldwin County Convention & Visitors Bureau is the non-profit destination marketing organization for Milledgeville and Baldwin County. 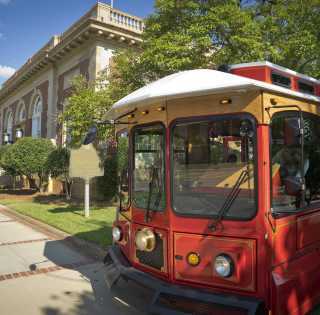 The CVB was created in 1997 exclusively to increase the economic impact of the hospitality and visitor industry by attracting individual visitors, group tours, and meetings and conventions to Milledgeville and Baldwin County. The CVB is primarily funded by hotel-motel sales tax collected from visitors staying in =local properties. To encourage and assist the cooperation between those businesses and industry servicing visitors, conventions and tourism in general.